When one door closes another opens so it is said. NYC recently lost one of the mainstays of clubbing in the city, Pacha. Flash Factory however is not a replacement. One can tell immediately by the roster of talent who have played and are set to play over the next few months that this venue is about attracting serious techno lovers only. 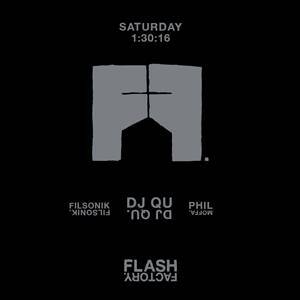 Having had the blizzard affect the Jan 22 intended opening, CGNY went along on Sat Jan 30 to check out Filsonik, DJ Qu and CGNY fave Phil Moffa. An impressive opening weekend line up. (Tiga had played Friday night). I was pleased to see my friend Jermaine on door duty, always a nice surprise and was ushered into the lobby for a cursory bag check. Fairly standard door policy. The design is great, boasting an almost church-like feel with the dj booth set up like an altar. Lots of stained glass look panels in the ceiling and walls compliment this and at times give it a warehouse-y feel especially when the light settings make it appear as if the light is coming from outside. Sound is on point. Crisp, clear and not overpowering. I moved around the large dance floor and it was consistent in all areas. Surrounding the dance floor is the usual table service seating which was filling up fast on Saturday but to right of the main floor is a large bar area with lots of seating space without compromised sound. Mike, one of the bartenders who served me was friendly and chatty and poured a decent drink. Not cheap but standard for an NYC club. The djs that night were great. Hadn’t heard Filsonik before but really enjoyed his groovy dance-y set. DJ QU played some blistering techno but the full on spotlight on his and the other djs faces was a little distracting as it also illuminated the whole front of the dance floor. Not always the best for dancing as techno favors darkness. An occasional flash would’ve sufficed. I didn’t stay for all of Phil’s set but what I heard was terrific. The club wasn’t too packed but I can imagine once word gets out this is going to be a hotspot. At $40 at the door it won’t be to everyone’s taste and those promoters who offer the gritty gloom of a warehouse in Brooklyn won’t be affected. But as an alternative to a hike to the borough, Flash Factory is a welcome addition to the NYC club scene.